Constructed of rugged hardened steel, the JBL paralyzer tip is a perfect blend of durability and performance. Each point is designed for low maintenance, dependability and most important results. Paralyzer Tips stop fish dead in their tracks and is an economic spear point with hardened steel tines and paralyzing action for better holding power. This tip is used in rocks and reefs primarily on polespears for medium to small fish. For polespear use in rocks and reefs. Never Leave Home without a Spare!!! 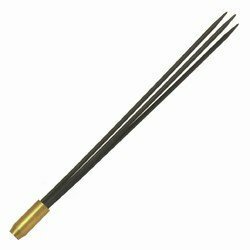 Scuba Choice Spearfishing Stainless Steel Pole Spear Tip with Single Barb Head, 7.5"